Elbrus – one of the highest mountains in the world, is located in the Northern part of the mountain system of the greater Caucasus, on the territory of Kabardino-Balkaria. It is the highest peak in Russia, often referred to the highest mountain tops of Europe (the so-called list of the "Seven summits"). Mount Elbrus is situated between the republics of Karachay-Cherkessia and Kabardino-Balkaria. The top of the mountain the double, West has a height of 5642m and East 5621м. 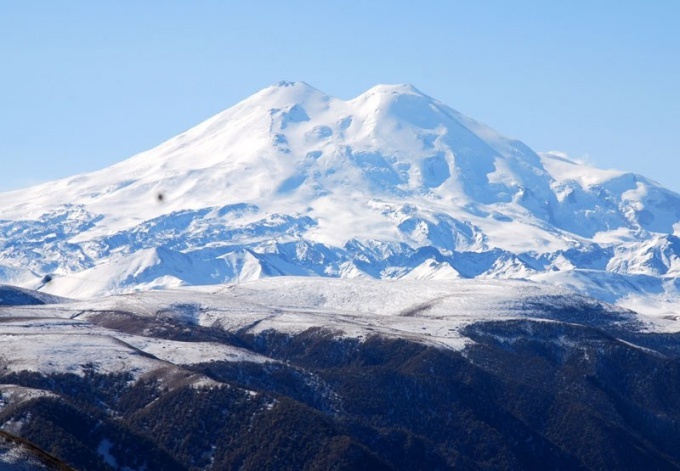 Elbrus – extinct volcano. The mountain has two peaks, one of which is a little higher. Scientists believe that in the history of the mountain there were two significant eruptions, as the rocks of mount Elbrus, according to studies, about 2 or 3 million years. Analysis of volcanic ash showed that the first eruption happened about 45 thousand years ago and the second about 40 thousand years ago. Despite the fact that the mountain is very high, to ascend to her relatively easy, it does not require exceptional skill, such as for Everest, and make it tries quite a lot of people. Up to 4 thousand meters of the mountain slopes are moderately shallow, but then begins a serious ascent. The steepness of the slopes can reach 35 degrees! Climbing occur on the East and West peaks. Usually begin the climb from the village of Azau, which is at the top of Baksansky valley. Here tourists spend about a couple of nights to acclimate to the altitude and not suffer from "gornyashki" - altitude sickness associated with the rarefied air and the unusual atmospheric pressure. On the first day people usually go to the Pastukhov rocks, and the second designate the climbing itself. Go out of the camp around 2am. First go to the Pastukhov rocks and then reach the saddle of the mountain, where trails are divided into Eastern and Western peaks. A little rest in the saddle – and the tourists go on to climb one of the peaks of Elbrus. The stunning beauty of the mountain scenery and the mountain since ancient times, it was the reason that Elbrus was attended by people from all over the world. The history of climbers of Elbrus is proud of the worthy names of climbers since the nineteenth century. Among them are domestic tourists and foreign. The peak of popularity of Elbrus occurred in 60-e years when climbing was especially popular in the USSR. In Beksinska gorge was even asphalt road and in the vicinity of the mountain built several Alpine and tourist centers. Today this place is popular also as a ski resort. People make descents from the slopes of Elbrus and Cheget mountain is nearby, it also refers to the system of the greater Caucasus. On the territory of the Elbrus a national Park, created to preserve nature in Kabardino-Balkaria. In the Park all the conditions are created to enable people organized and to relax in comfort.